To many, blogging is not just a hobby, but a business, a career. Time and again, we have emphasized the importance of keeping a business-minded approach in order to be successful. Being a business of sorts, blogging should also be treated as such. Businesses require investments, and need to grow. So does blogging. When people create a free blog, they don't usually think ahead, and instead end up restricting themselves. The most people would do is, buy a domain and leave it at that, especially Blogger users. They don't realize the importance of a proper web-hosting. Hence, in this post, we talk about why you should get a web-hosting, and which host to choose. Before we move on, I'd like you to take a look at what we've covered so far in this series. Web-hosting refers to storing your website files on a separate and dedicated web server. This is different from domain hosting. Domain hosting simply refers to purchasing a custom URL for your blog. While it is true that Google provides free web hosting for your Blogger, the fact remains that this hosting is really limited. You will face the following restrictions even if you buy a custom GoDaddy domain for your Blogger blog. These are some of the many things that differentiates a blogger from a webmaster. Beginners often don't realize their importance, and are hesitant to spend money on a proper hosting. These features come in really handy if in the future, you want to expand the scope of your blog, and want to add custom pages, applications, tools, and add your custom scripts. This very blog you are reading runs on Blogger, but is hosted at a custom web-host. We've had experience with many web hosting companies, and have found HostGator to be the best option for bloggers. We ourselves are using HostGator for hosting this blog, along with our sister blog Smart Earning Methods. HostGator provides one of the best hosting services one can ask for. If you navigate over to their homepage, you will find that they have won numerous awards and achievements in their field. And if you search anywhere for the top web hosting companies out there, you will find HostGator everywhere. And not without reason. Their inventory of features is simply astounding! And that's just the start! 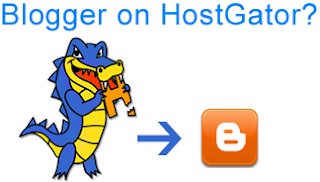 HostGator has three basic web-hosting plans; Hatchling, Baby, and Business plans. The above mentioned features apply to all. In addition, if you want further options, you can choose the Baby or Business plan. These plans have flexible payment options. You can either pay on a monthly basis, or once after every three years. The longer plan you choose, the cheaper it will become. We ourselves are using the Baby plan. It allows us to host an unlimited number of domains on our server. However, most beginners should go for the Hatchling plan, because they will most probably have to deal with a single domain at max. We have more than one blog, so that is why we need the Baby plan. So if you intend to create more blogs, you should choose the Baby plan. Otherwise, go for the Hatchling plan. They have much the same features, except for the option of unlimited domains for the Baby plan. The Business plan is for corporate businesses, and doesn't apply to bloggers. One thing that makes HostGator stands out is their excellent 24/7 customer support. They will help you at each step in the installation and setup of your blog. You can also use their live chat, which will connect you to an assistant within a minute! You can ask them any questions, and they will help you out as much as possible. HostGator also goes crazy on its rates! It offers discounts all the time, and you can use a coupon code to get as much as a 75% discount! That, coupled with a long-termed plan will reduce your investment by a great deal.